I am lucky enough that friends I have met through the brocante over these last thirty years invite my groups to come and see their homes. To go beyond the facade by entering into the soulful homes offers such thoughtful generosity into the culture and life of the French. Even if you do not speak the language of the host the spirit moves. I love that I can show those who come and join me a personal one of a kind experience by visiting my friends, to witness the charm of France and be inspired by both. Such a treat to be welcomed into someone's home and allowed to go through all their collected brocante treasures. We had lunch made for us, then tea, and dessert, fresh strawberries served in lemon juice and rum. Friendship the true gift in this adventure. The first of the season, French la Vie's latest group started out yesterday for a week, to be followed by a second group. Gloria, Barbara, Jennifer and I had such fun! Easter week is full of brocantes in villages throughout Provence, this first group wanted to focus on textiles as they are crafters and artists who teach classes on different techniques using textiles. Luck would have it that we have met the mother lode of textiles at every brocante we have encountered. So much so that my eyeballs are swimming in lace. Lace, ribbons, notions, fabric, quilts... a bonaza of joy. My longtime friend Jennifer from the Bay area has joined us and I am thrilled to spend these next two weeks together. She is a firecracker, a rock star a genuine teammate! Please follow me on Instagram where I post photos and videos of what we are seeing and doing. It is so easy to post to my stories on Instagram so if you want to "feel" like you are there, take a peek. Today we went to Barjac that has a Bi-annual brocante throughout the village. Baby bonnets everywhere I looked. Why is that? If you were to come on a French la Vie what would you like to see? What type of experience in Provence would you desire? I love what Myrna said when she came to France and went to the brocantes with us, she said, "Everyone should see a country through going to brocantes because you are able to see the countryside as you travel to out of the way antique markets, mingle with the locals, have guidance as to what things are and the history reveals the country's past." We also have the most fun getting to know one another, and sharing a part of our lives together which during the week is charged with dosages of beautiful inspiration. Each French la Vie is handcrafted to meet the dreams of each group that comes, no two French la Vie's are the same though each group meets my closest contacts and hopefully wants to explore the brocantes. In June my friend Francoise will lead a group in Bretagne as I cannot join them due to the arrival of a baby brocanteur that is due to come. I am so lucky to be able to show you Provence through the lens of the brocante. Notre Dame love, faith and the promise of Joy! and the marathon trailed far behind in what I wanted to post on my blog. Though today I saw a connection that seemed to bring a moment of stillness in the sadness of what has happened. Chelsea (seven months pregnant) and I followed Yann while he ran the marathon in Paris by mapping out his course, calculating where and at what time he would be along the 42 km trail so that we could cheer him on as he ran by. Yann was running faster than expected which meant we had to move faster between the meeting points if we wanted to see him. Our last meeting point before the finish line was in the Bois de Bologne at the 35 km point. When we arrived Chelsea noticed on the app that we were using that Yann had considerably slowed down, and we began to wonder if he was alright. We stood on stumps to see if we could see him. If you have never been to a marathon let me tell you it is hard to find a runner in a sea of runners but at last, we saw him his hand was on his head as he weaved back and forth mumbling, "I cannot do it, it is too much, I cannot feel my legs, I cannot do it." He looked terrible he had the face of defeat. I started to cry, and cheer him on with a mumble of words and emotions, at the same time as I was uttering my encouragement, I saw Chelsea leaped from the stump and run to her father. She joined him in the race, putting her hand on his back, "Papa you have this, breath, your legs are moving, they are taking you to the finish line, breath, let the pain go, you can do this, focus on your breathing you are going to make it." It was so beautiful to see Chelsea act without a moment of hesitation, without a moment of reflection to herself. She knew exactly what her father needed and she knew she could help him reach his goal. And there it was in that moment, encouragement, an extension of oneself to another, love, faith and the promise of joy. He said it felt great until it didn't, the last four miles he could not feel his legs. But he is ready to do it again. I posted videos of the day on my Instagram stories and on Facebook. Group coming for a French la Vie Journey. Life is never dull. Yann is running the marathon in Paris tomorrow (Sunday). then you will need to look up his name Yann Rolland-Benis. Chelsea and I will go to different parts of the course to cheer him on. Last year Chelsea ran the marathon this year she is doing a marathon due in June. Should he shave his mustache? His beard? I said no so loud I am sure he heard me in Seattle. Today was the day my dad was born. My dad's shop was a milking barn but when I was fourteen he stopped dairy farming and went into motorcycles. He kept farming rice, and went riding on the weekends. My dad had many different motorcycles, his Harley was his favorite. Later the shop became a hang out for those who loved to eat, breath and sleep motorcycles. My brothers, cousins, and friends still gather there to shoot the bull, drink beer and occasionally work on their bikes. My dad's spirit is alive and kicking, as his heaven might was here as well. Racing tickets, photos, news articles, tags, motorcycles stickers... it is like a gigantic scrapbook dating back to the late sixties. The photos are fading on the walls. Though if you ask anyone gathered there on a Friday night they will relive the moment as if it were yesterday. The Shop is where I feel my dad. The pegboard holds some of his tools. There is something to be said for things that remain the same, used, borrowed, shared, but remain the same. but our home changes every weekend with my buying and selling so I guess keeping anything the same would defeat the memory of how it is. Inside my dad's Harley's side packs were his jacket, vest, chaps. French Husband and I took them out admired them for a while, shared a story or two, shed a tear, then put them back where they belong. or just hold like a magic wand to take you back. Those stools if they could talk. I remember when they use to be in the house, by the bar that my cousin Doug made. When years of use rendered holes in the fabric my dad tape them with duck tape. 1972 and still standing strong. Every Friday night the guys still gather in the barn the shop. My dad would say it wasn't a place for ladies. Too much B.S.ing, drinking, and hot air. The walls are lined with trophies, literally to the rafters. Motorcycle trophies of my dad's and brothers'. I don't know who has the most, they do, but they don't care about that. Photos of my brothers, first on bikes, then on motorcycles. We all started riding young. My brothers would say I didn't ride. I guess the scars I have just mean I fell. I don't remember the pain of falling, but the fun of riding. Stacks of bikes where the cows use to gather in the stalls. Heck no, they just gather dust and sometimes are salvaged for old parts. As I took photos my littlest nephew tagged along. He found a broken trophy top on the ground. He asked me if he could play with it, "It fell off from up there Aunt Coco. Can I play with it?" I told him he could have it. I like to think my dad's spirit knocked it off just for him. He pretended to be racing while he laid on the dusty barn floor. Zroom-Zroom is what he calls motorcycles. down the lane and take off. Your love is present and I am blessed because of it. but two dogs sat on top of boxes of old postcards. "They're not mean, just playful." "Lucky for me," I tried to smile, "I do not need any more postcards." Brocante with dogs. Is someone, somewhere trying to tell me something? What would I have done if those little critters were hopping about on a brocante table that had everything I ever had hoped to find? Good question, and so happy I did not have to confront that issue. Tarte Tatin is one of my favorite French desserts, it is a classic down to earth recipe when it comes to the array of French desserts, it is not the Marie Antoinette of pastries, instead, it is a French Country type that I can imagine having at a long farm table by an open fire. The other day I had every intention to make a Tarte Tatin, but time was not on my side and guests where around the corner. So I had to improvise that is what I do since I usually have too many grand ideas and little time to put them in place. Or you can say I am scattered, or as my mother says, "... too many irons in the fire." Personally, I like working under pressure, I like the creative response it musters up in me. Hence, Mini Tarte Tatin was born. Peel, core, and chop four Golden Delicious apples. Sautee until the apples are golden and the sugar is caramelized. Cut rounds of puff pastry dough, large enough to cover each cupcake tin space. I made twelve. "As any grocery store has excellent puff pastry dough for under two dollars," as Annie use to say, "it is not worth making it from scratch." Which fits right into Corey Amaro's by the sit of the pants cooking style. When the apples are ready add them to the pre-buttered tin. Of course, you can add cinnamon, walnuts, raisins... but then that is not the classic Tarte Tatin recipe. Then cover them with the puff pastry rounds, tucking the ends in a bit. Bake at 350 degrees until the tops are golden. When they are ready, take them out of the oven and flip them over onto a large platter. Or gently scoop and flip each one over. For added delight and that wow effect, you can drizzle caramel sauce and serve with ice cream. The TGV (high-speed train) from Marseille to Paris and visa versa takes three hours it is significantly faster than driving by car or by flying. I returned home tonight after spending a few days in Paris visiting my dear friend Laura from Colorado and then this weekend with Chelsea. "The train station in Marseille opened on 8 January 1848, on the land of the Saint Charles Cemetery. The station is perched on top of a small hill and is linked to the city center by a monumental set of stairs. traffic has increased from 7.1 million annual passengers in 2000 to 15 million in 2007 and the station is currently the 11th busiest in France." The Entrance to the train station in Marseille. "The station was once a key stage on the sea voyage to Africa, the Middle East, and the Far East, before the popularisation of flying. The station, originally isolated from the city, was equipped with a grand staircase, envisioned by Eugène Senès in 1911 and opened in 1926. It is bordered by statues inspired by all the distant locations to which people sailed from Marseille's port." A bit of the French countryside. If you take the TGV try to have a ticket for the upper deck, the views are spectacular. I love to see how each season changes the landscape. Steps leading down to the center of Marseille. to the right about a fifteen-minute walk is the port entrance to the Mediterranean sea. Paris is a wonderland this Spring as the pink blooming trees are wearing nature's crown jewel. Against the greyish white buildings, the pink is intensified. The light in Paris, mixed with the stark stone facades and the blooming trees is striking. Notre Dame Cherry Blossom Trees. Rue Monge Cherry Blossoms in Bloom. Eiffel tower covered in Cherry Blossoms. Jardin des Plantes in Bloom. A detail of the impressive facade of the Louvre. The most beautiful person in Paris as I see it --- I can say that especially now. Yesterday evening I came to Paris to see my friend Laura who was in Paris from Colorado with her daughter Lily, Ryan her son in law and granddaughter Camille. We met for dinner. The last time I saw Laura I was pregnant with Chelsea, Laura met Chelsea for the first time this evening and Chelsea is pregnant with her first child. I met Laura's daughter about eighteen years ago when she was doing a study abroad program in Spain. Lily came and stayed with us over Christmas break for several weeks. Such a delightful evening to meet everyone at once... well nearly everyone. Laura and I spent time with reminiscing snippets of memories yet most the time fully aware and happy while soaking in each other's company. A well full of understanding the extraordinary circumstances of our meeting one another at the monastery. As it is in friendship we picked up where we left off. How I wish I did not live so far away. We walked around Paris with her two-year-old grandchild Camille who was in a stroller. A doll baby who has a vocabulary of a four-year-old. Such fun seeing Paris through the eyes of a child. Love as you know has no limits, and where takes us is on a journey to wholeness. I am on the train to Paris... it is such a beautiful day, and as the train whizzes through the countryside spring is there waving its hands. Tomorrow I am going to Paris to see a friend I have not seen since I was pregnant with Chelsea. our stories of then, in between and now. I can hardly wait to see her. When I lived in a monastery, the Abbot asked who knew how to cut hair? I raised my hand, I had never cut anyone's hair in my life but being 19, in a monastery, I had to claim amusement where I could. But before I started my new job as the hairdresser, my friend Laura asked if she could cut Sweet Father Dominique's hair, he was the first guinea pig. She asked him what type of haircut he wanted, he said a light trim. Slowly, with a gleam in her eye, she buzzed every single hair off his head. Every single hair. He smiled. Then with the same look in her eye, she asked if she could trim his beard? He said yes. She shaved it off- his beautiful salt and pepper beard, gone! I was aghast, how could she. Shyly Father Dominique asked if she was having fun? Laura giggled, "Yes indeed." I did not understand Laura's humor nor Father Dominique's calmness. Then she asked him if she could trim his eyebrows! I could not believe my ears I shook my head no. But he agreed, she shaved them too. Father Dominique looked stark naked. Father Dominique looked in the mirror, then he looked at Laura holding the clippers. He smiled, stood up, shook the hair off, and said, "I need to go now, for I am certain you will ask me to trim my eyelashes, and I fear I would agree." Sometimes, the holiest thing we can say is no. On April 1st the French give each other chocolate fish called: "Friture." The tradition has it that on the 1st of April children try to stick a homemade paper fish onto people’s backs without the person knowing it, then run away yelling, ‘Poisson d’Avril’ (April's Fish), which is like saying, "April Fools'!". The tagged person is meant to give the trickster fritures, small chocolate fishes. Since Easter is usually around April 1st, the chocolate fish "fritures" are also given at Easter as well. Back in the day, or I should say in the year 1900s give or take another thirty or so, the French mailed Poisson d'Avril cards to one another. When French Husband first told me about this April's Fool fish thing it was back in 1987. I had come to France to meet his family. During this time, which happened to be around the first of April he told me that April's Fool was about tricking someone by pinning or tapping a paper fish on someone's back. A few days later on April first. I made two small red fish. French Husband and my Belle Mere (Mother in Law) were going to a meeting. Before they left I sneakily taped one fish on French Husband's back and another on my Belle Mere's back without them being aware. I was tickled beyond belief at how "French" I felt as they walked out the door to their meeting. When they came back I asked if anyone had noticed the fish tapped to their backs? Their eyes widen as it registered what I was talking about, they quickly looked at each other's backs. I told them I had taped the fish to their backs before they left for their meeting. Neither of them was amused. In fact they looked at me like I was some sort of alien fish. I could feel myself sinking, going downstream. I had made a faux pas on the day were faux pas are expected. Duh. French Husband questioned, "You put a fish on our backs as we went to an important meeting with our lawyer?" "Uh huh. I did. But in my defense, I didn't know the meeting was important." Needless to say, they didn't buy me any fritures chocolates. But it is SUCH a good memory! After dinner they started to see they humor in it. Maybe the few glasses of wine helped. Then as most jokes later are retold and told again they found it hilarious. And eventually congratulated me on such a comic pull. I have never fished anyone again. Nor have I bought those fritures. Though the old French "Poisson d'Avril" cards, oh yeah I have plenty of them. What is it all about this Aprils Fools Day thing anyway? Have you ever played a prank on the first of April? If so tell me about it in the comment section, and or if you have had a prank pulled on you. All one needs is love, well actually to love and be loved. for the love, you showed me and for the love, I saw you share so freely with others. Love what a difference it makes. Where do you store everything you buy at the brocantes to be sold later? In my house, in our place in Paris, in my studio, under my bed, in my closets, in the garage, between the sheets, under pillows, stacked on the bookshelves, on the chairs who needs to sit? Stacked in the corner, on the top on my head. Do you have someone who packs it up and ships it out? Do you do your own bookkeeping? All of which are time-consuming chores. 30 percent of what I do regarding my work with sourcing at the brocante is actually what I love best, going to towns in France, talking with dealers and buying antiques. The other 70 percent: Loading the car, inventory, taking photos, writing about the things I bought, sending out emails, writing potential buyers, posting to Instagram things I have for sale, collecting packing material, boxing items up, going to the post office, unloading the car again, the bookkeeping, paying taxes... is the work side of it that is simply that: Work. I do most of it by myself. Yann helps me ENORMOUSLY as he is my sherpa, bookkeeper and takes everything to the post office. He is my Brocante Bug Hero. What is square footage of your places. Is property expensive one gets out of Paris? Also, click this 2016 Property price guide in France. So many factors go into the value of property. This is a subject that is tossed around often in our home as Yann is a real estate investor. Do you have a collection of photos saved in a file, with the wonderful quotes that you share, or do you take these daily and one at a time to post to your daily blog? Oh, how I wish I was that organized. I am not. I do have photos, way too many on my phone and computer but they are not in any order. I do reuse photos I have, and forget to use others. For years I took photos daily. Though for the last couple of years I am so into what I am doing I forget to take photos and then wished I had so I could post a photo here. I have instagram and post photos daily on my stories simply because it is easier to do so. So yes I have photos, take photos and forget to take photos, I am not at all dogmatic about how I go about posting... Except to do something on my blog every day. When are you going to publish a "Book of Annie"? It could be a best-seller! I do not believe her family would want that. Will brown furniture ever make a comeback in France? Here they are marketing antiques as "sustainable" furniture because they almost can't give them away. Brown furniture or Louis Philippe, certain Belle Epoque style, a certain type of brown furniture is and has been extremely cheap. It is exactly as you say: They almost cannot give it away. I do not see it making a comeback for a long time. Sustainable or unfortunately firewood as brown furniture cost less. A large brown armoire that used to sell for thousands now can be bought for 200 or less. We are in Paris in May for a few days. Staying St Germaine area. Any local spot/spot you would recommend we check out. As I like to wander about when I am in Paris one of my favorite streets to do so is to walk along Rue du Cherche-Midi for all sorts of charm, delish, history, culture, and inspiration: 22 Le Cherche Midi an Italian place for lunch, the department store Le Bon Marche. because it is beautiful, La Grande Epicerie de Paris, the mouthwatering amazingly attractive grocery store that is a modern palace for foodies. Drop in at the Ecole des Beaux Art. Debauve & Gallais oldest chocolate shop...Pistoles de Marie-Antoinette was one of Marie-Antoinette's favorites they still make it dark chocolate (99%) with various flavors almond, coffee, orange flowers. Luxembourg garden is a must as is Bully on Bonaparte. It has been nearly 14 years that I have been blogging, sometimes with gusto, sometimes with a peek, usually with a photo. I will answer them in tomorrow's post. Chelsea and Martin (who live and work in Paris) came "home" for a long weekend. Their first stop was a local second-hand store where they bought a few pieces for the new apartment. Nothing puts a fire under one to get a move on like an upcoming baby. Nesting is a real thing, and it was in full gear this weekend. Luckily we live fifteen minutes or so from Martin's parents, so it tumbled into place, each us of picking up a task to cleaning up the pieces Chelsea and Martin bought, a work day and shared lunch together. Spring was in full glorious force! If the pool was warmer I would have jumped in. This little cupboard needed more than its share of TLC, Martin's mom removed the dark brown color, plus the doors were wobbly. This is not the finished product. Brown stained furniture takes time to strip. Donna (Quiet Life) a blogging friend who I have never met, but feel I know as we "met" blogging in 2005. Donna's daughter Katie who I have seen grow up online on her mother's blog came to France and will be in Europe of two months. Katie arrived today, so she was thrown into preparing the nest work day. She fit right in. Katie will spend a few days with us. also, adorn flip flops, a mask, and a six-month baby bump. Martin's family has a workspace that has ever tool and thing needed. It was a dream spot with everything in place and nothing missing. Alette made this delicious Paella for lunch. Bought a demi lune that opens up to a large dining table. We painted it. The guy who hates being a handyman was a brief handy man today. A small glass cabinet, we painted the inside and outside. Mo from Reve d'Argiles pottery will go inside. Now to get it all to Paris and in one place. Blooming purple with a note of glee. Here I am, such a tender little flower reminding me of faithfulness against the odds, courage with grace. The little things I have collected that have no real value on their own, due to a chip, crack or a tear instead of throwing the defaulted bits and pieces away, or disregarding them to a chest of drawers never to be seen again instead I have collected these fragments in apothecary jars. Creating, "scrapbooks or "scrap jars". No need to turn the page to see what is next in the scrapbook instead all I need to do is turn the jars around. Do you have scrapbooks? Of junk drawers as my mother calls them? it is a beautiful gift to have. Sharing memories especially with those who need to hear how their lives have touched mine. Thank you for reading my blog, for your ever generous response, for the many gifts you have given me by your words, friendship, prayer, and good thoughts. I am lucky to know you, and my life is fuller because of it. A little over a week ago Yann ran a semi-marathon in Paris, he will run the marathon in Paris on April 14th. He started training in January with Chelsea as his coach. They are a good team those two. Yann is an obedient student who would never disappoint his daughter and Chelsea is a strong, constant, encouraging coach. The goal was to run the semi-marathon in two hours, Yann did it in two hours and forty-three seconds. During the first two kilometers, he wore his bright bogger green jacket as he calls it, then handed it off to Chelsea who was waiting and cheering him on at the 2KM point. This marathon craze started when Chelsea ran it last year. Due to Chelsea being pregnant (her goal for this year) she is not running. But they are hoping to run a semi-marathon sometime next year. But that depends on the baby, doesn't it? For the record, Sacha and Martin do not run due to knee injuries. As for me, cheerleading is a sport I enjoy. Chelsea was six weeks old when French Husband came home with a pair of tickets for a Chanel fashion show. A friend from work had given him the tickets since he couldn't go. 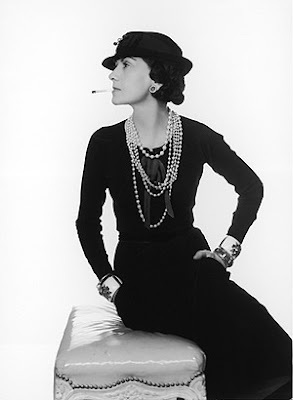 Coco Channel photo source Chanel. My excitement was instantly tamed when French Husband announced that the show was the next day. "What am I going to wear?" were my first words. My closet did not hold anything labeled Chanel, let alone Casual Chic. To top it off I was breastfeeding. For those of you who have breastfed you know what that means, especially in those first weeks after birth. Not only did I have a pair of shooting guns, but my breasts were also the size of melons, while my non-maternity clothes were the size of gumdrops. What was a girl to do? My pocketbook was bare though my desire to attend the Chanel fashion show was bursting out of my seams. The next morning while sitting on the edge of the bed breastfeeding I had an idea. 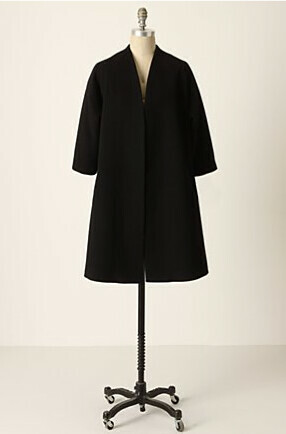 I could wear a dress I had made of black wool jersey, it was a simple dress but I could wear it under a vintage charcoal wool dress coat that had a massive black velvet collar. Yes, it would serve the purpose. Imagine lightening. That was the speed in which I cleaned up that butterball baby Chelsea and myself. I made it on time. I wore freshly cleaned black heels and that coat for a dress. as you wind along the tight turns with intense views of the sea far below. Cap Canaille is 394 m (1,293 ft), it is the highest sea cliff of France. The rock face of Cap Canaille is called Falaises de Soubeyrannes. The rock consists of layers of ochre-colored sandstone, conglomerate, and limestone. When the sun sets it turns pink or orange depending on the weather. The name in Provençal is Cap Naio. It has been misunderstood in French and changed into Cap Canaille instead of "Cap Naille". Another reason why I love Cassis. A Throw Back to 2009... Since I am travelling to Ireland today I thought I would repost something 'Irish'... Scones! School holidays are happening as I type. French Husband and Sacha went skiing. Chelsea came home with more books, binders, and notepads than laundry. She has finals and nothing else matters more than intense studies right now. My broken rib, lack of skiing skills, a daughter who needs a devoted mother to feed her, and my love of silence allowed me the avenue to stay home. I am happy the sun is shining. I asked Chelsea what she would like to have for lunch, she replied, "Scones." A flood of memories poured in with that one word... Scones. Don't you love food memories? Oh how they nourish the heart and soul, giving it food for thought without calories. The memory of scones does just that...and we are not even from Scone-Land. Scones, muffins, bagels and cupcakes are not a French thing. Instead Brioche, pain au chocolat, escargot, croissants and pain perdu take their place. During the school holidays, when our children were little, I often made scones for them. More often than not, when we made scones something happened, interrupted us from our scone making-- or caused us to make them in a flash. It got to the point that if we were going to make scones, we would expect something unexpected to happen. If nothing happened, we would doubt whether the scones would turn out. And guess what? The best, flaky, moist on the inside, crisp outer texture scones arrived out of the oven. I discovered the secret ingredient in making scones: Distraction." Recipe from my friend who is Irish: Mary Kate (Allison's Sister). Half a teaspoon of baking soda. Two tablespoons of cold butter, crumble lightly into the flour mixture. and a small container of yogurt (about half of a cup). Fold until blended. Dust the table with a little flour. Place the dough on it, gently knead and pat out into a circle. Cut the scones using an upside -down, juice glass. Makes 6 or 8 scones. Preset oven to 375 and bake for 6 to 8 minutes. Turn off oven and let rest for a couple of minutes or so. How funny that out of thousands of things at a brocante fair a charm that size of my fingernail could grab my attention. This green daisy or Margurite in French has two parts, a cover that turns around a stationary part the has words written on each petal. The finely printed words I could not read when I bought it, but I took a chance that it would convey a sweet secret and I wasn't wrong. On the petals are written, "I love you with all my heart." It sure beats that game of plucking petals and saying, "(S)he loves me (s)he loves me not." The couplet is repeated until all of the petals are discarded; the line is spoken when the final petal is plucked divines the truer statement. While the rhyme can be gendered in any direction our heterocentric, traditionalist media would have you believe the ritual is the preserve of lovelorn adolescent girls and their younger counterparts. Faust: What’s that? A nosegay? Margaret: No, it’s just a game. Margaret: You will laugh at me, do go! Faust: What are you murmuring? Margaret [half aloud]: He loves me – loves me not! Be oracle of gods to you! He loves you! You understand that word and what it means? He loves you! Malcolm Jones (in his book The Secret Middle Ages dates the first printing of the “The Daisy Oracle” 1471, when Augsburg nun and scribe Clara Hätzlerin included it in her Liederhandschrift (songbook), making this the oldest rhyme we’ve tackled so far. The rhyme is still sung in Germany (liebt mich, liebt mich nicht). “The Daisy Oracle” is thought to be French in origin but all the evidence is anecdotal." via the Ouora. "He loves me, he loves me not or She loves me, she loves me not (originally effeuiller la marguerite in French) is a game of French origin, in which one person seeks to determine whether the object of their affection returns that affection. A person playing the game alternately speaks the phrases "He (or she) loves me," and "He loves me not," while picking one petal off a flower (usually an oxeye daisy) for each phrase. The phrase they speak on picking off the last petal supposedly represents the truth between the object of their affection loving them or not. The player typically is motivated by attraction to the person they are speaking of while reciting the phrases. They may seek to reaffirm a pre-existing belief or act out of whimsy. In the original French version of the game, the petals do not simply indicate whether the object of the player's affection loves them, but to what extent: un peu or "a little", beaucoup or "a lot", passionnément or "passionately", à la folie or "to madness", or pas du tout or "not at all." Via Wiki. Walking along a street I saw an older woman sitting by a window. If it hadn't been for the brown worn shutters, and the white sheer curtain that framed her face... I would not have seen the small shadow of a person peering out. Aiming my lens at the second floor I hoped to capture the stillness of the scene, the age, the solemn color, the moment. The woman by the window didn't sit still...she moved in and out of the shadow of the curtain. I held my camera and waited. While I was focusing my camera on her silhouette, she turned around and looked directly at me. Her eye and my eye caught each other inside the lens. Instead of taking her picture, I lowered my camera and sheepishly smiled at her, then I held my hand up, sort of as a wave and an apology. Her eyes sparkled as she smiled back, and I knew she didn't mind. I wanted to ring her doorbell and run up the stairs to meet her. Instead, I walked down the street, carrying the image of her smiling at me. What a lovely image to have. At that moment, in our silent exchange, I felt like we met. Have you ever felt like that? A chance meeting between two people where something goes beyond words, time or activity, and you know you have shared another space and time together? were one of Van Gogh’s favorite subjects. Almond trees flower early in the spring making them a symbol of new life. Vincent van Gogh (1853 - 1890), Saint-Rémy-de-Provence, February 1890"
to another in a seasonal cycle, typically to lowlands in winter and highlands in summer. Yesterday the sheep left Saint Zacharie for the long journey to the alps. My daily walks during this period are filled with the awakening of nature after its wintery sleep. The air changes, it is softer, with such fragrance. Everyone comes out in the springtime. My daily walk takes me up this hill which is a killer it goes up and up for at least a fourth of a mile or more, it feels like more, I am sure it is more. This is off the beaten path, in a field, I love walking by this little cutie. Though whenever I walk through these fields I am always a bit worried a dog might come to protect his territory. I am brave until I hear barking. That is the mountain to climb. "In 1889 Van Gogh entered Saint-Paulde-Mausole, an asylum at Saint-Remy, originally a 12th-century Augustinian monastery, some twenty kilometers north of Arles. To Van Gogh, Saint-Paul-de-Mausole was an asylum, monastery, and studio all in one, which was why he so gladly opted for the isolation. Isolation was what he wanted; the ascetic in van Gogh could indulge in whatever mortification he pleased, and the painter, playing the part of a patient, was in a place that supposedly sought to encourage art. In the medieval world, monasteries had been the true home of images,- and the modern age was fascinated by the metaphor of life in a cell as an aid to artistic creativity. "Nature", Nietzsche once wrote, "Entraps the genius in a prison and stimulates his wish to break free to the utmost." Doing without the stimuli of everyday reality was, of course, an excellent way of paying what one owed: Van Gogh's mode of payment was his detention itself rather than madness. His bouts of mental instability reinforced his resolve to turn his back on the world. Indeed, they were to make communication with the world beyond impossible for him. In the asylum, between attacks, Van Gogh devoted himself to his art with a desperate determination, knowing that this alone might save him. He called painting "the lightning conductor for my illness." And observing his continued ability to paint, he felt sure that he was not really a madman. Unique small journeys in Provence regarding everything beautiful with a focus on faded grandeur. Each journey is one of a kind personally curated if you want to experience Provence or Brittany, see it as you have seen it on my blog, go to the brocantes, have delicious meals, meet the French visit their homes and of course surround yourself with inspiration and enough beauty to fill yourself from head to your toe and burst your heart... French La Vie Journeys. French Husband in the 18th Century? A black iron-trimmed shower with a shelf and stool built in. This will be the kitchen, in front of Rene will be the living space. The Serge Mouille light will go in the kitchen. But with antique pieces too. These Cotto Esagono 3D tiles for the wall in the WC. Z2 Ona Lanterns in various sizes for the entrance. Inspirations, let us see where and how it goes. The renovation in Cassis continues. Rene and his team have been tackling the project with gusto even with the setbacks that come with additions and surprises that are found when renovating a century old property. One addition was to change the window casings which are white plastic ones known as PVC to aluminum tinted charcoal throughout the entire home.. This will give it a more loft chic appeal. Yet changing the windows was purely an aesthetic choice. Which meant a delay in the kitchen as the windows being replaced are above the kitchen counter. As the windows are very large and the entrance very small we will have to go up four flight and over a balcony with a crane. Should be interesting, but not as challenging as moving things upstairs with a ladder on a flatbed truck over an awning. The other set back came with renovating the sinking stairwell in the entrance. Sinking yes, but probably would have not collapsed for another hundred years, but when you walked on them the impression was it could happen tomorrow. The surprise came when they found out that the stairwell was an old addition over another apartment below. The stairwell was made as they were made before: Make a frame, add whatever you have around to fill the frame and block the steps off with branches to hold them in place. The steps we discovered were also extremely shallow in depth. Therefore they are being completely renovated in iron and eventually cement. A massive undertaken in a tiny space. The two men at the bottom are at the entrance level, the two men on top are at the bedroom first floor inside the apartment level. The stairs leading up go to the kitchen, living space and large terrace. The stairs leading to the kitchen/living space were not as old and had been made in cement. Branches that were used to form the stairwell. The kitchen floor and the stairs leading downstairs, these are not as old, as the entrance stairs. I decided to take the tiles off and then case each step in iron and trim the border in iron as well. The old steps at the entrance with the new iron casing. In any renovation, there is always truckloads of debris. Joel the mastermind ironsmith, who did our stairs in Cassis is working on this project. The bottom steps to the entrance have iron front panels to support and hold the cement that will be poured in later. Meanwhile, under the two dropped ceilings we found this underneath an arched brick ceiling with rusty iron bands holding it in place. We decided to keep the ceiling. Rene is plastering the ceiling to fill in the nooks and crannies, then he will sand it off to give it a used look. I cannot wait to show you the final effect. Meanwhile, next month I will have the two French la Vie Journeys. If ever you want to join me in seeing Provence through the eyes of history, lovely meals, looking around the corner to the hidden secrets and of course through brocantes let me know. All those little things that say something that words fail to or actions deny. All those little things that let us know that the moment is right, that we are on to something good, that it is okay, that we will be alright. The way the morning light reaches into our bed, the way the hot water runs down our bodies, the way the church bells ring just at a time when silence needs to be broken. The way a strawberry taste or a daffodil springs yellow into the darkness, or the way a kite tail plays in the wind against a cool blue sky. The little things that speak a message out of nowhere to a listening heart. of the past, that feels the same as now. Whatever I do, or say, whatever you do or say, whatever anyone does or says comes back to the whole. I believe whatever I do or say affects us all, not just me. If it affected just me that would be too easy, too much like right and wrong, to infantile: Oh you did good you are going to have a golden star. Or you did a bad thing you are will be punished. to the future of love or evil, light or darkness, hope or fear, joy or sadness, being one or being alone. The first dance I ever went to my mom chaperoned. I was okay with that because at thirteen what mattered was that I got to go to the dance. Before arriving at the dance my mom told me, "Whoever asks you to dance say yes. It takes courage to ask someone to dance and you are here to dance. When the music starts if no one has asked you to dance, then ask someone to dance with you or go out and dance by yourself." for good measure my mom added, "I do not want to see you sitting around, just dance." I danced ever dance either with someone or alone. with whom she intends to dance each successive dance at a formal ball." "The act of asking a lady to dance had to be carefully orchestrated. A gentleman should stand at a comfortable distance from the lady, bow slightly toward her and request the honor of her presence as a dancing partner. He should never be hasty or overly sure of himself, and should never ask the same lady to accompany him for more than four dances; as such a degree of informality is improper in a ballroom. Furthermore, he should always be well acquainted with a dance before participating since any mistakes he makes during a dance put his partner in an awkward position. A lady, in turn, should not refuse a gentleman's offer unless she has already accepted another's proposal." and some of them are filled. Also, it still has its original pencil. Thankfully my dance card wasn't full when I met French Husband at the I-BEAM. Oh, that girl and her funny faces. I laughed, "Really you think I can just stop?" and added, "Too late now." Chelsea makes faces and French Husband has gotten over it. My only regret is that I do not lie closer to see Chelsea more often. I opened them to form a cup. I prayed, imagining my prayer taking form into my cupped hands. I opened them, letting them pour out to the hands underneath. Trusting that the loving hands underneath my own held my prayer. That is faith, bringing me courage, to face whatever comes my way. Chelsea's smile had a tinge of mischief and her eyes started to sparkle. I thought to myself this is not going to be a typical response, I better prepare myself. I sat down. She said she would like to parachute out of a plane. I looked at my feet and thought to myself that is what you get for marrying a wild Frenchman. This is what you get for raising independent children. This is what you get... no Coco Chanel, no little something wrapped in a pretty blue box, that you can hold in your hand, and wear for years to come. No, this is what you have a free-spirited daughter. I could almost hear French Husband licking his lips with glee. 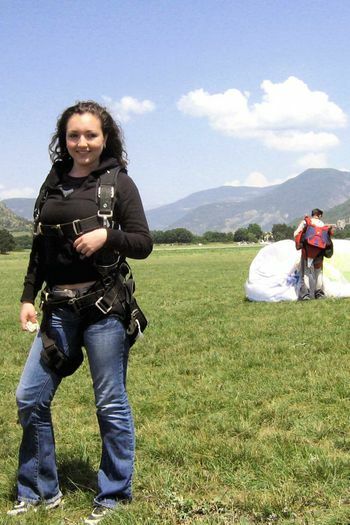 Chelsea jumped out of a plane or parachuted, as it sounds more civil. 1) When they ask you how much you weigh this is time to add several pounds to the number. You want the straps to support more, not less. 2) Before you "buddy-jump," with the professional- ask him where the pull cord is. That way in case he should faint, or get a bug caught in his eye, or die, you know where to pull to have that parachute open up. 3) If you feel like throwing up lean your head to the side, and turn your face up otherwise it will come back on you. 4) Keep your eyes open and breath, feel your freedom. Not at all? Not even a tiny bit? No, not even a tiny bit. Okay, maybe a teeny tiny bit. With that, I thought how would life be different if we weren't afraid? Afraid of hurting someone? Afraid of failing? Afraid of getting hurt? Afraid of making a mistake. Afraid of something I cannot label? Well I would jump out of a plane if I knew it wouldn't hurt not even a tiny bit. What would you do if fear and pain weren't in the equation?